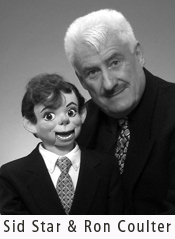 I'm Rick Johnson, and ventriloquism is one thing that is even more fun to do than to watch! I studied ventriloquism and performed throughout my teen years but it wasn't "cool" by the time I went to college and my dummy waited in his suitcase for the rare occasions when I would take him out and he would accuse me of neglect. Our arguments on those occasions would have amused Freud. As an adult I've re-discovered ventriloquism and my ventriloquial family has grown. It's wonderful to perform again and see an audience light up. As Vaudeville vent Fred Maher printed on his letterhead, "Their faces shall be wreathed in smiles, and their hearts, with mirth, made lighter! " I'm not sure what first interested me in ventriloquism, but I suspect it was watching Paul Winchell and Jerry Mahoney on TV, and seeing ventriloquists perform in my home town of Eugene, Oregon. My inspiration to perform came from Ron Coulter, a director, actor, playwright and ventriloquist who taught drama at a nearby college. Ron and I met at the First Christian Church where we both acted in a play written by the pastor, the Rev. Dr. Carlton Buck. It was titled, "The Tragedy Of Procrastination." As I recall it had five virtually identical scenes wherein the protagonist (played by me in childhood and by Ron as the teen and adult) put off that "Come To Jesus" moment until finally, in the last scene, the now elderly and dying man lay prostrate and unrepentent before the Pearly Gates as they slowly swung shut. End of story. No curtain calls. Hard to miss the point of that one. Despite the melodramatic context in which we met, Ron proved a generous mentor who took me on as a vent student when I was twelve. He taught me the discipline, creativity and joy of the art. That was in 1963. Over the years we both moved away from Eugene and lost touch with one another. In 2003 we discovered we were both living in San Francisco and celebrated a reunion after almost forty years. Ron is still performing ventriloquism with Sid, his partner of over fifty years. 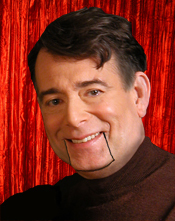 In 2004 Ron wrote and performed three one-act plays for vent and dummy, and introduced ventriloquial drama to an audience who, for the most part, had only seen ventriloquism as a variety act. Still a prolific writer, Ron and Sid appeared in the 2008 San Francisco Fringe Festival. Ron brought his unique blend of drama for vent and dummy to Off-Broadway in NYC for the 2009 Frigid Festival. Visit Ron and Sid's website at www.CoulterandStar.com.